No need of an introduction "The Carnival capital of the world", Rio Carnival is celebrated by all from the most humble villages to the most luxurious households, everyone joins in and celebrates in style! Rio Carnival is a crazy 5 days celebration, some 40 days before Easter. It officially starts on a Friday and ends on Fat Tuesday, with the beginning of Lent on Ash Wednesday, after which tradition says that one is supposed to abstain from all bodily pleasures. Carnival with all its excesses is celebrated as a profane event and can be considered an act of farewell to the pleasures of the flesh. With all that partying out of the way, it's no wonder that most people involved definitely need to detox! Carnival traditionally occurs in February, which is the hottest month within the Southern Hemisphere, when the steamy summer of Rio de Janeiro reaches its absolute peak. There are in fact Carnival celebrations in practically every village and city throughout Brazil. The most widely recognized are featured in the northern cities of Recife, Olinda and relatively nearby Salvador. Along with all other Carnivals in Brazil, the Rio de Janeiro Carnival marks the beginning of Lent, the 40 day sacrifice period before Easter. 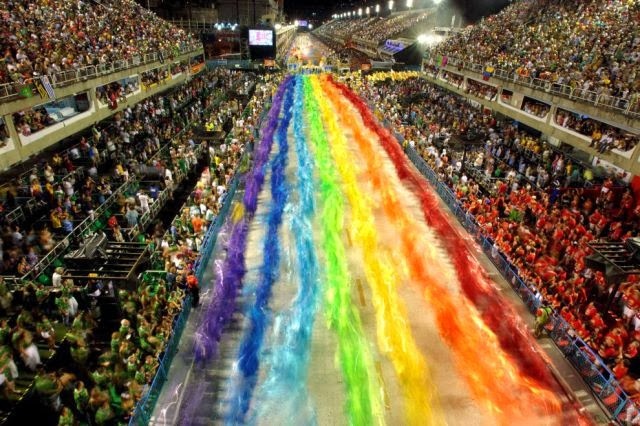 In 2011, 4.9 million people took part in the Rio Carnival. 400,000 were foreigners. The 1st Festival dates back as far as 1723. There are typically more than 2 million people on the streets every day during Carnival. The principle Carnival parade takes place in the Sambadrome. Samba originates from Bahia and comes from African rhythms,. It arrived to Rio in 1920. Numerous Rio residents actually leave the city to escape the noise during Carnival. The Rio de Janeiro Carnival is considered the “world’s largest party”.